I've had this entire weekend without a single plan except a wonderful raucous Thanksgiving dinner with 17 friends. So what does that mean? Time to sew-sew-sew...and listen to a book. Plus, it's raining here on the Central Coast of California, finally, and it feels so good to sit inside and listen to the rain. I finished Marcy Tilton's Vogue 9230 which I'd started a few weeks ago. I loved making this jacket. It's not easy. And I wonder where Vogue lists the difficulty level now? Is it the colored symbol? I couldn't find it on the package. That doesn't mean it's not there...I know someone will tell me. I can't find it on their website either. I think this must be average or maybe somewhat advanced? It's tricky but fun. 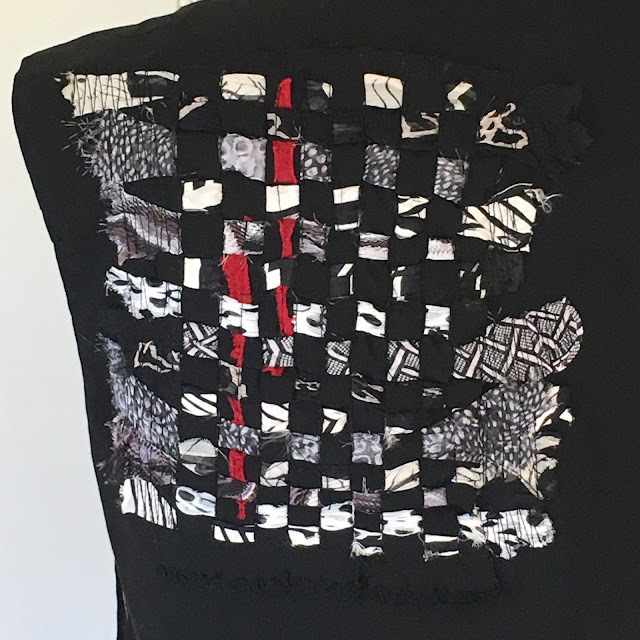 I used a unique fabric that has metal woven into it so it has a strong opinion about where it wants to wrinkle, twist and turn. 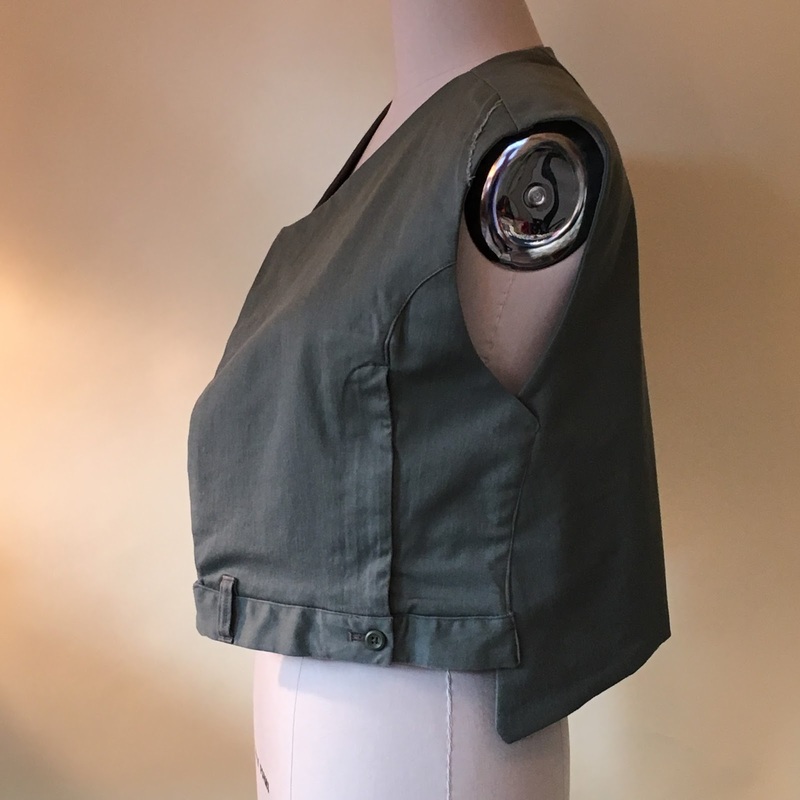 It's easy to sew with but feels sort of like wearing armor! It has every chance of being rain resistant but I don't think it really is, darn it. The tricky part of the pattern is where the bottom pieces fit onto the top of the jacket. It's do-able though, and is very unique. I could see this being flattering on all kinds of figures. Because of the sticky-outie nature of this fabric the bottom back pieces needed to have the pleats sewn down. It worked fine and you may want to do that with the fabric you choose since there is quite a bit of volume in the bottom. I love the collar, plenty of drama here. I auditioned button after button but maybe I just have button fatigue or something, none of them seemed to work. 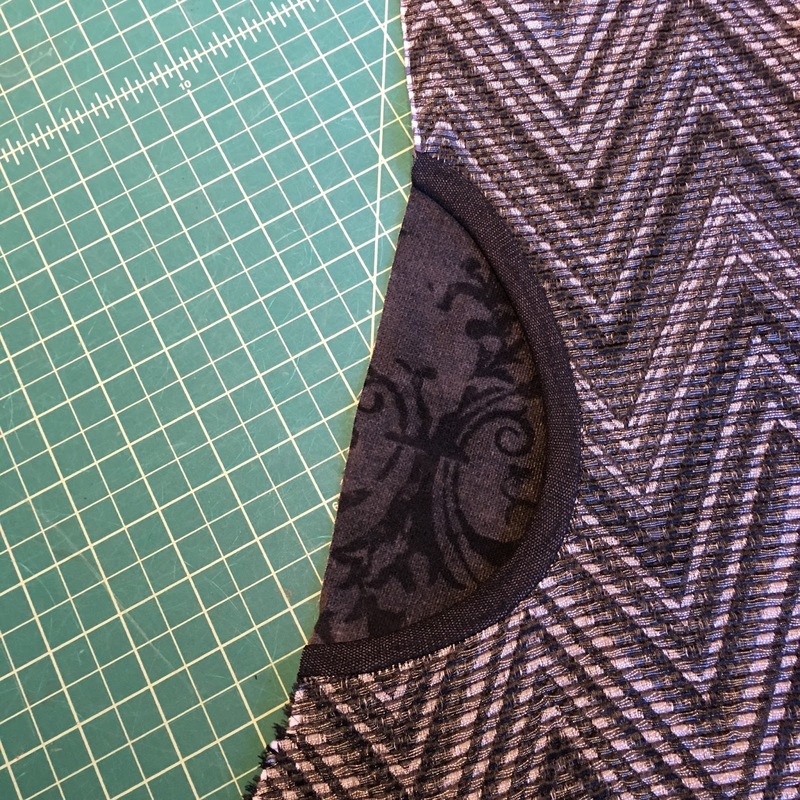 I've been wanting to use this snap tape for years now and it worked well on this fabric and shape. When I told my husband I'm going to get a lot of wear out of this garment he laughed. What the...??? I couldn't figure that one out....but yeah, I will wear this often. It's comfy and stylish, my kinda combo! OK, here goes with this one. Yes, this is a Diane Ericson Faultlines Vest, and yes, it's made out of men's slacks. While I was at DOL last month one of the attendees brought in a big bag of fabrics to give away. I swooped in and got several wonderful pieces, thank you Lucy! 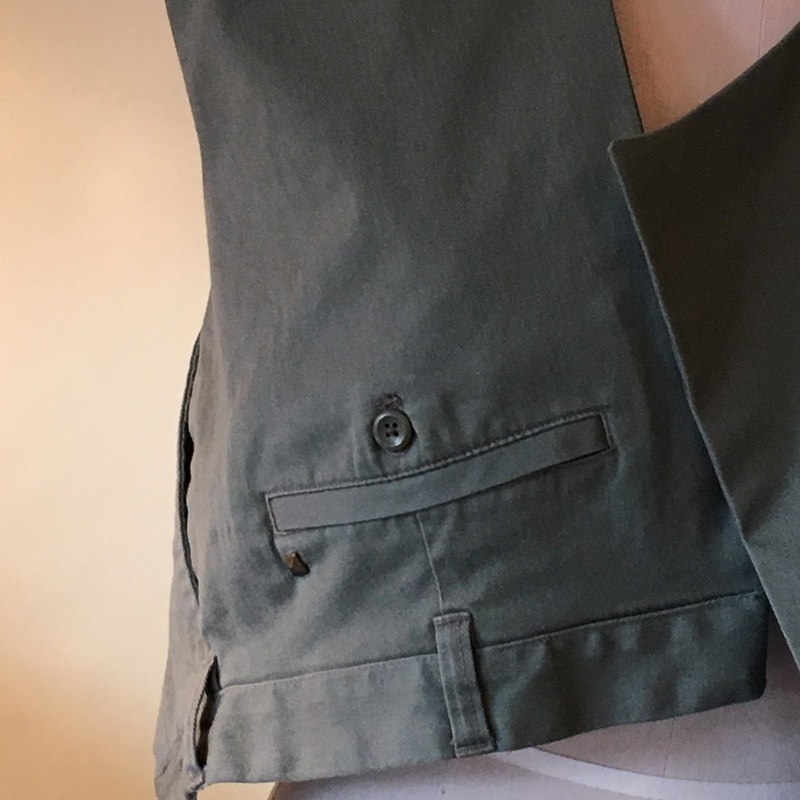 Her husband's worn out khaki slacks were among them. I've had them on the dress form in every angle you could think of. I knew I wanted them to be upside down. Finally, the Faultlines pattern came to mind and it worked. The layout was tricky. I got almost all of it cut out in the fabric but had to use another fabric for two of the lining pieces. Boy, men's wear is made so that it will survive any disaster you throw at it. Just "unmaking" these pants took hours. 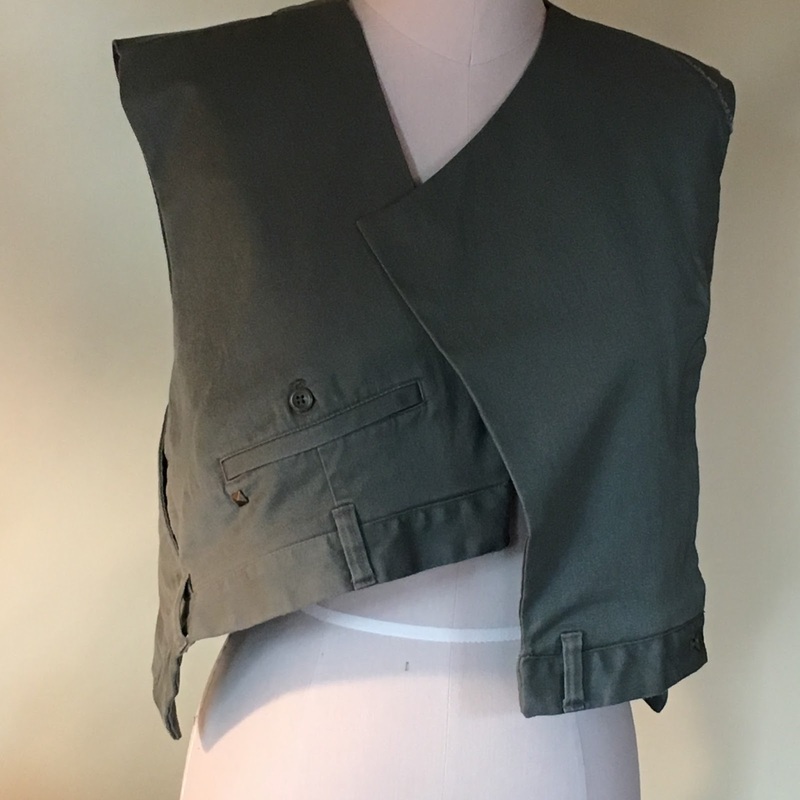 I wanted the vest to be as lightweight as possible so I took out all of the pocket linings. 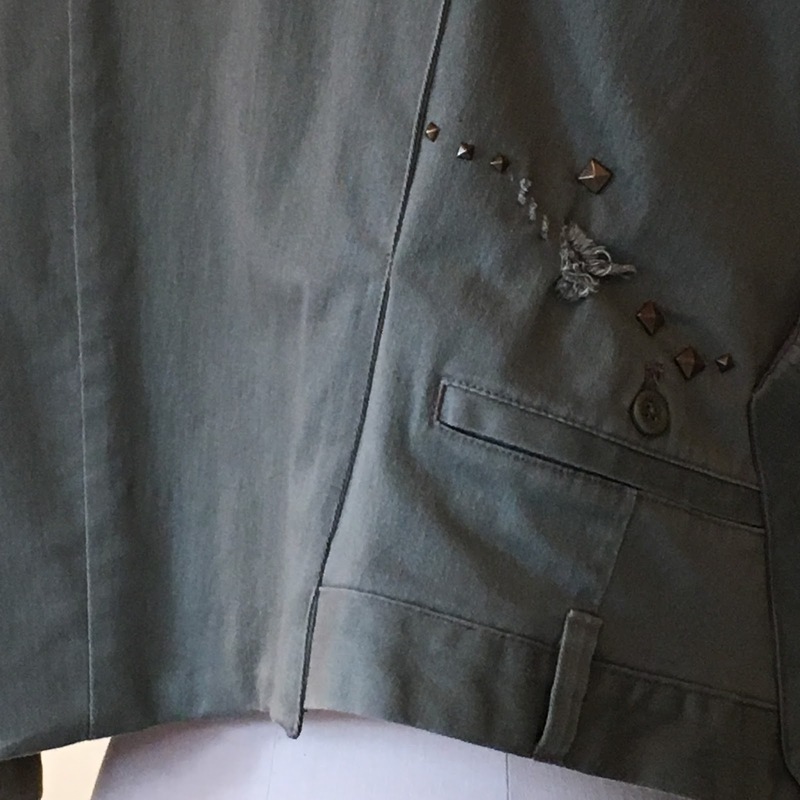 I also ripped out the clothing designer's symbol and put a bronze stud in it's place. You can see it just below the upside down pocket. I think the fly is hysterical. It will be interesting to wear this and see what people say. Will they notice? Will they say something or just walk away...?? Here's the close up. There was the hole just below his back pocket. That's probably why he threw them out. I didn't feel compelled to cover it. I just couldn't think of anything that would look right so I left it. Finally decided to use more studs to bring even more attention to it. I'll give this puppy it's day out soon and then decide if I really want to wear it. The process alone was fun though! I hope your holiday weekend was full of the things that make you the happiest, whatever that might be. This last fall's Viktor & Rolf runway show blew my socks off. I downloaded it over and over again to study the details. 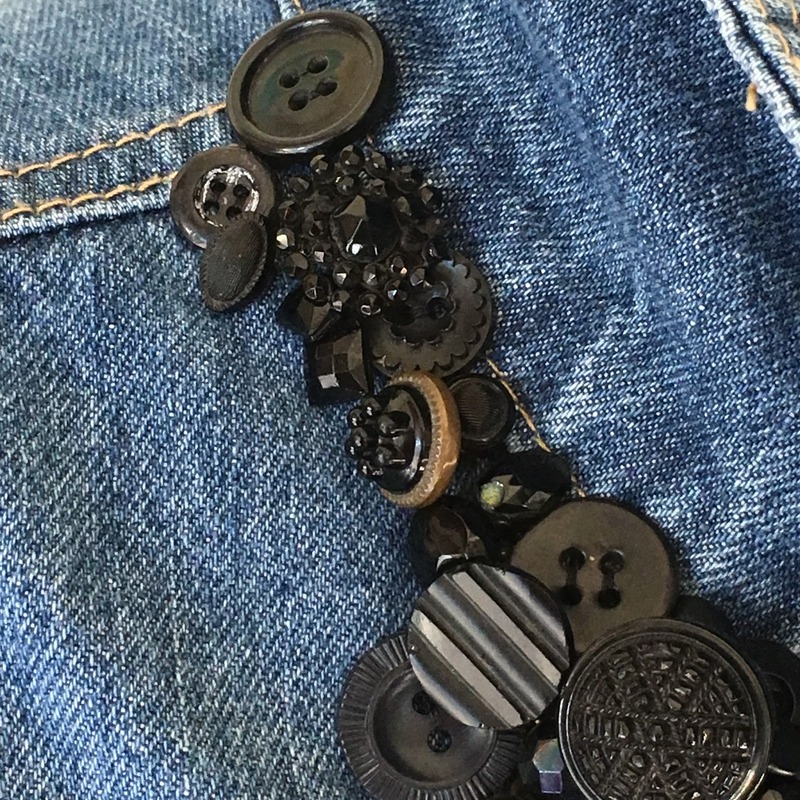 I particularly love the use of denim but the whole thing just calls to me. I made two efforts at using the weaving technique in the show to some success but, as with so many things that look simple at first, the real complexity of the design has eluded me thus far. I'm not sure I'll work with it again but I might. Here are the two pieces I made using their concepts. 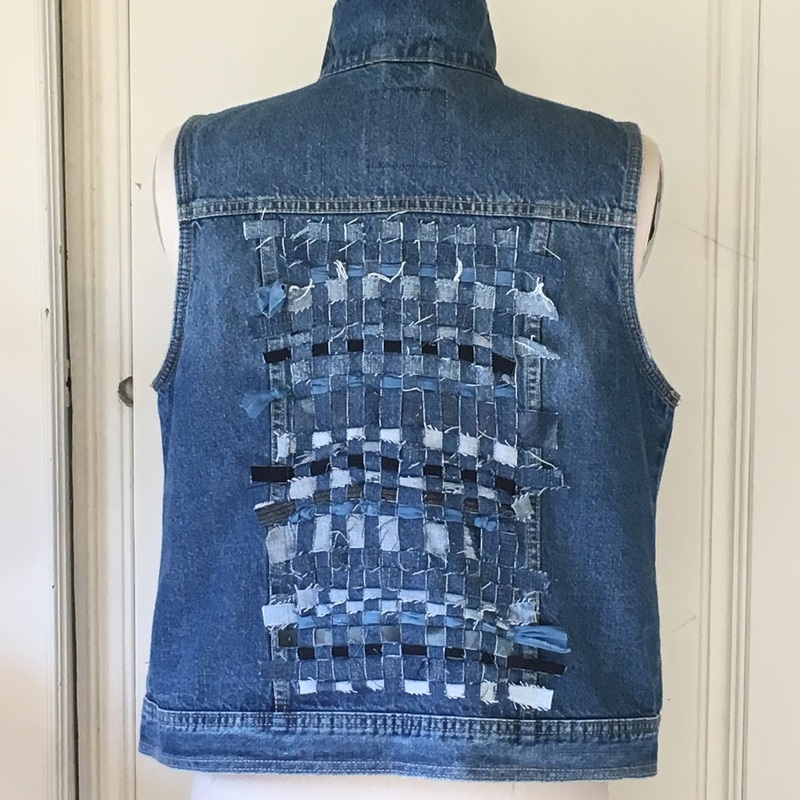 The first is Diane Ericson's Fault Lines Vest. I made it a couple months ago and love the lines. It's a blank canvas-type pattern. On the front I simply used scraps of a beautiful red wool. On the back I applied the Viktor & Rolf weaving using scraps from old silk scarves. 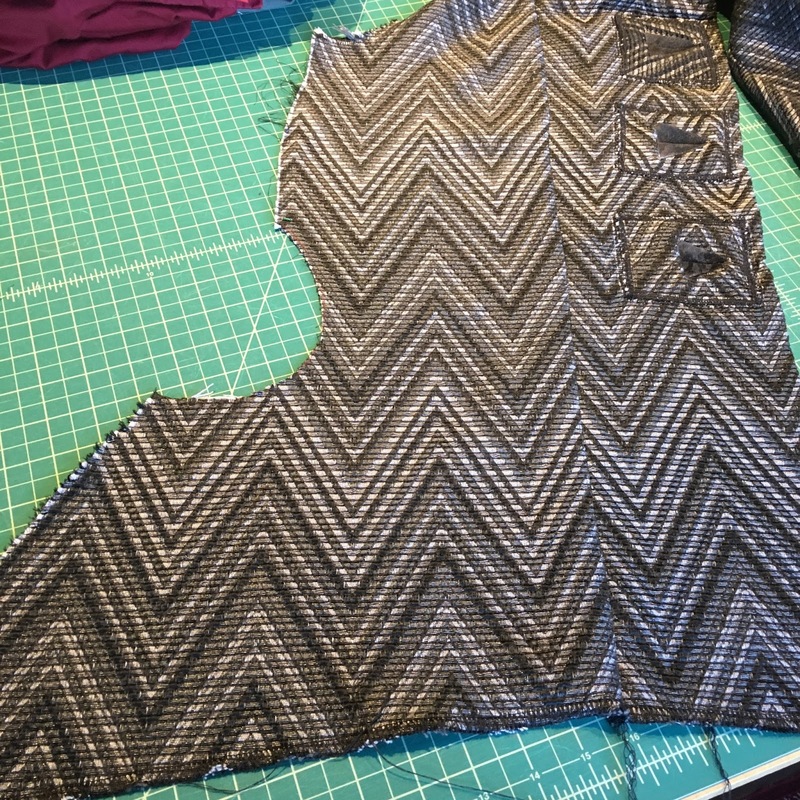 The body of the vest is a black stretch woven so I was worried about stretching that might occur if I cut into it. I decided to weave the scarf scraps onto a piece of the fabric and appliqué the whole thing to the back. It worked well and gives the same feeling as if I'd woven it right into the body of the garment. I secured each vertical strip with a line of stitching. 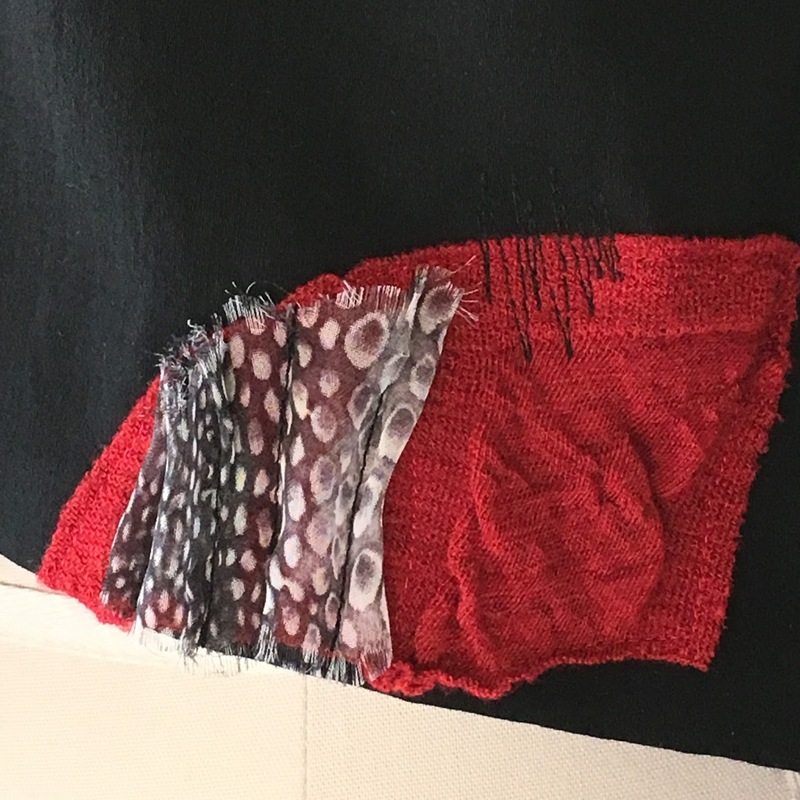 I thought the back needed another detail so I added a hint of color at the hem. 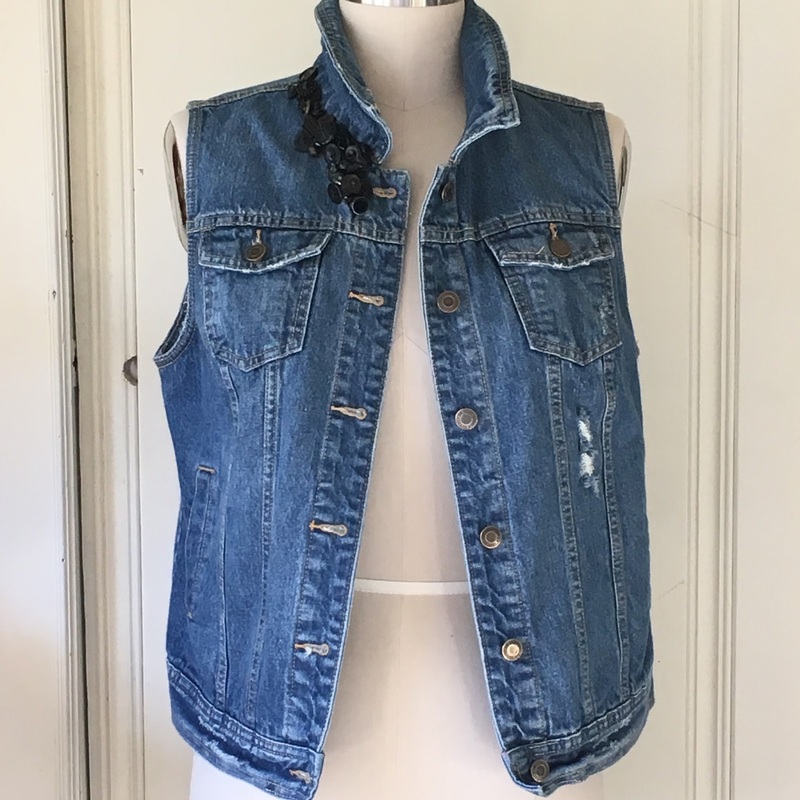 My next attempt was on a Levi vest I just bought from a sewing pal. I kept it simple in the front, only using some of the buttons I inherited from my mother's massive collection. In the back I positioned the weaving in the center panel. A sewing pal, Lisa, was smitten with this technique, too, and had finished a Levi jacket that I admired. She placed the woven panel in the center back so I gave it a try. She also lent me some Levy scraps because I have none...being the one who is always trying to de-stash. Plus, she gave me some really good tips to make the process easier, like pinning as you go and using an embroidery hoop if your fabric could benefit from it. 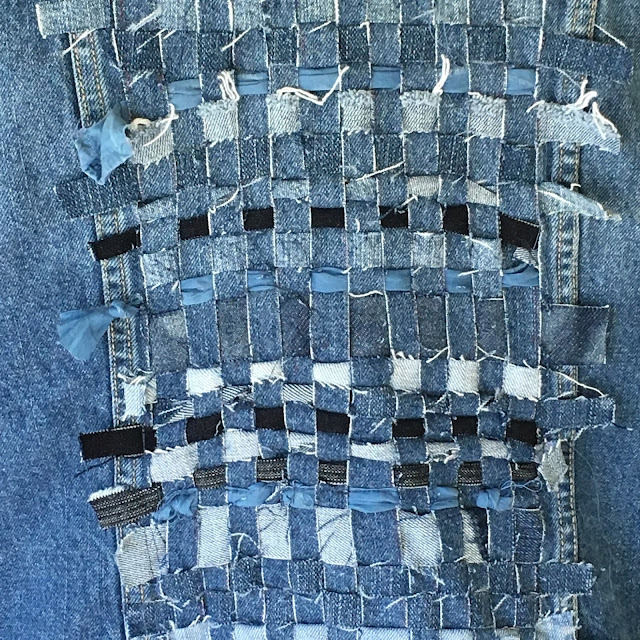 Many of these denim fabrics were so stiff they didn't "bunch" as much as I wanted them to. I like the thick and thin widths though, and the pieces hanging from some of the edges. I like the results but would need to really work with this technique to get stunning results. Once again I'm reminded that couture fashion may seem frivolous at times but those exquisite techniques are borne out of years and years of experience in the ateliers. I admire the men and women who toil anonymously and I think they are, in great part, the reason for the success of the designers they work for. But, I'm happy to see that some designers are beginning to publicly recognize these artists. Karl Lagerfeld actually honored them in his fall 2016 runway show. I'm so happy to wear this vest because of the buttons I used. I've taken them out and played with them for years, wondering what I could ever use them on that would bring them to life and not be too precious to wear on a daily basis. I know some of these buttons like they are family members. Finally, they have a life outside the button jar! I've had a super busy fall season. First I attended another Boro class given by Jody Alexander. 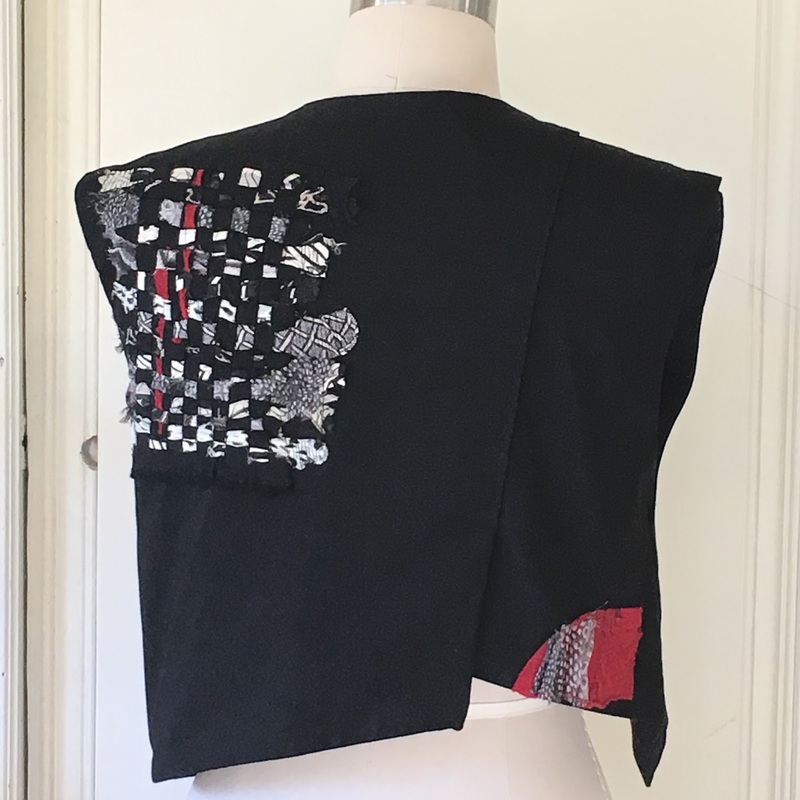 Then I took a wonderful eco printing class from Pia Best- Reininghaus sponsored by the talented felter, Marilou Moschetti. That was fun and I learned a ton. THEN, I had an annual sewing retreat in San Juan Bautista with 19 of my dearest sewing pals. And finally I went to Ashland for DOL (Design Outside The Lines) with Diane Ericson. 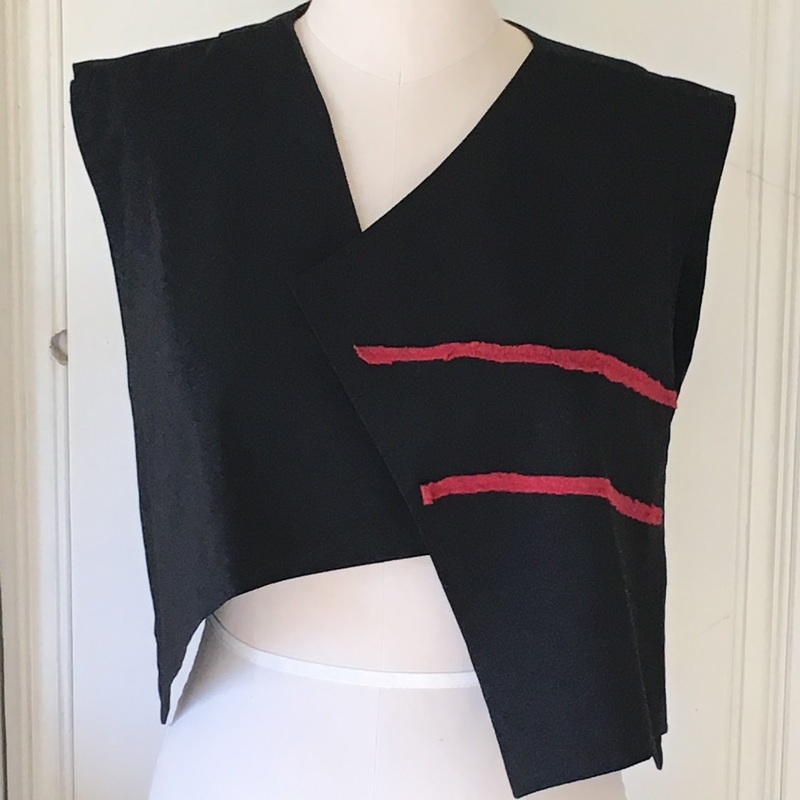 She is on fire right now with all new ideas and designs using remade clothing, making components for garments and designing new garment patterns. I love everything she does. Marla Kazell was the guest instructor. I wanted to take this particular DOL (not that I want to miss any of them!) 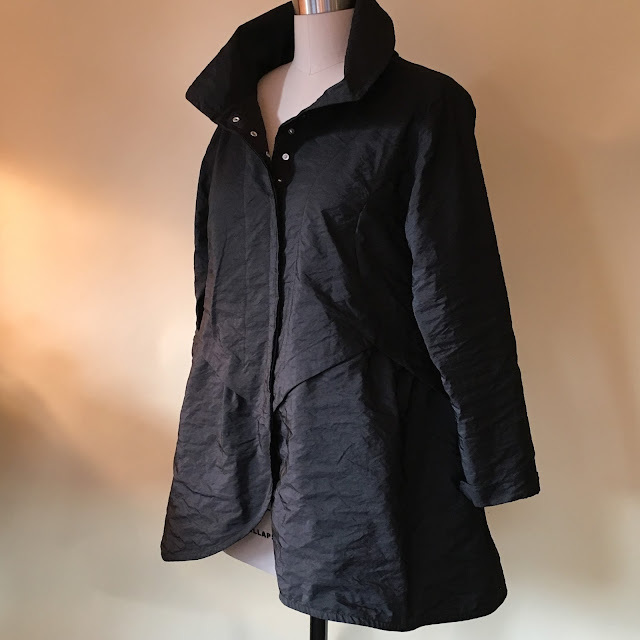 because Marla would be showing couture techniques she uses in her Koos Van Den Akker-inspired jackets. She's a terrific teacher, too. I learned a lot from her. She's very patient and is really there for her students. 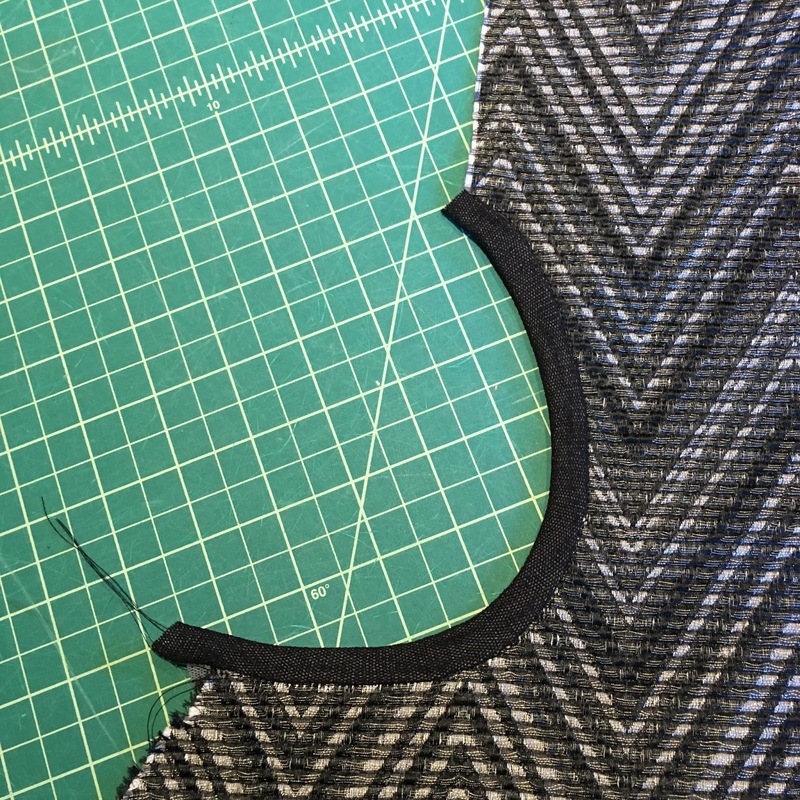 I learned how to make triangular bound buttonholes that you'll see further down in this post. It was full on fall color in Ashland. My husband and I rented a condo right in town and had a great time wandering the shops and eating in the fabulous restaurants. He took in a play and toured the three theaters since he is a playwright himself. I just took in the sewing design magnificence in the Ashland Springs Hotel workroom. 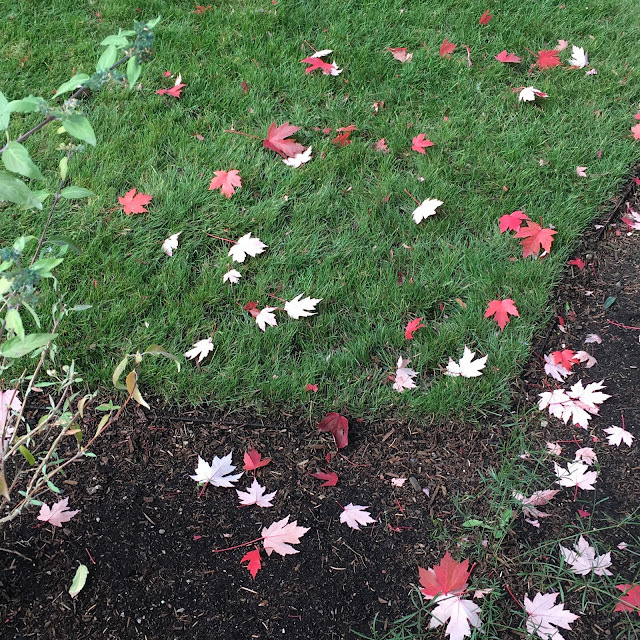 Just a little glimpse of the fall color. I regret not taking more photos, it was so beautiful. 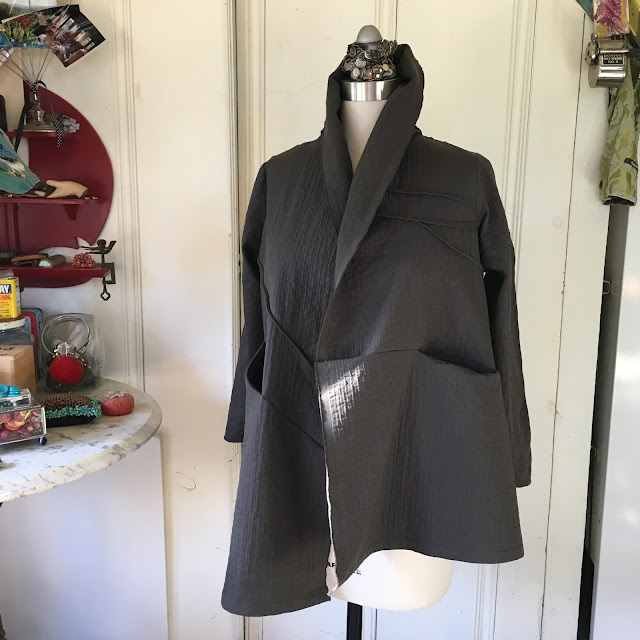 Diane has a studio in town where we visited one afternoon to paint fabric and schmooze with Miles Frode, her artist son who paints incredible canvas for making one-of-a-kind garments. He's also begun making very cool coat pins. 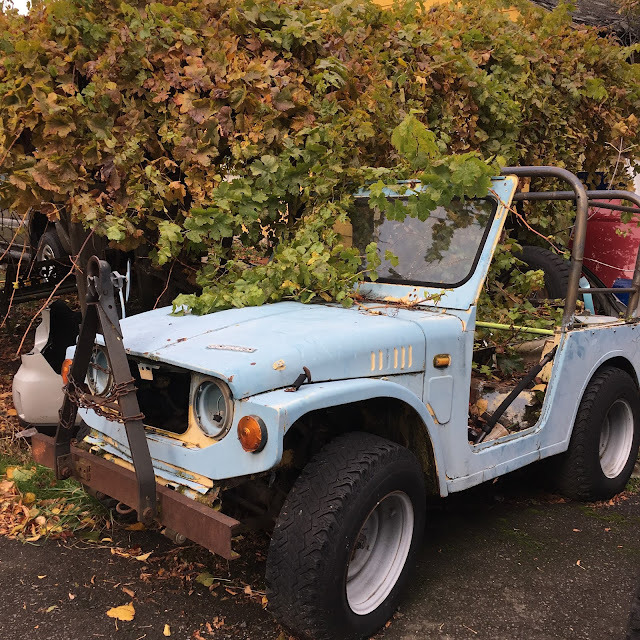 This jeep was on the way to the studio and I had to stop. 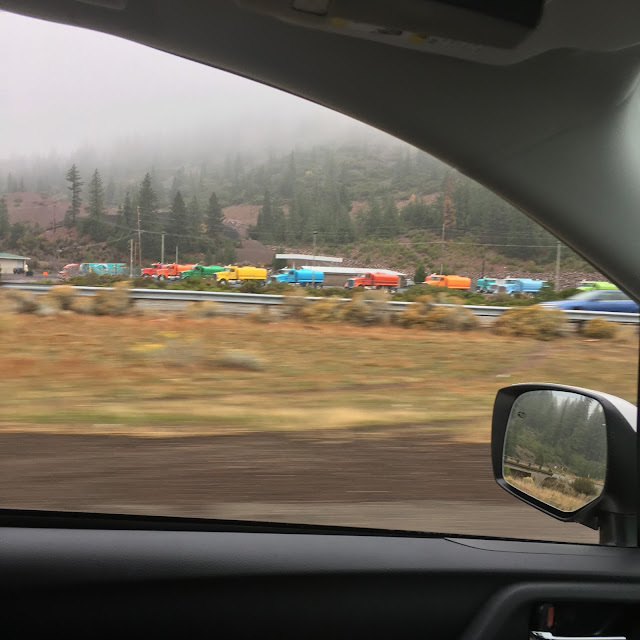 These candy colored trucks are one of my favorite things about driving up to Ashland. They sit along Highway 5 and give me a belly laugh every time I see them...whaaat?? I came home with two partially completed jackets. 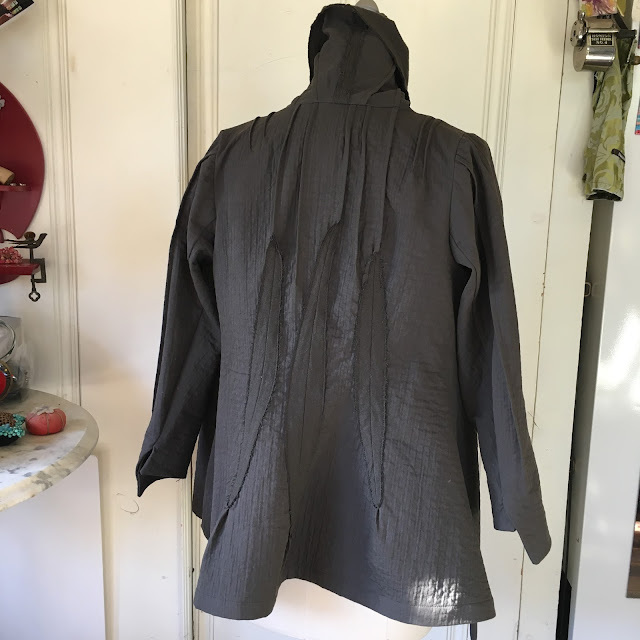 The fabric for this first one is from a double sided cotton; woven on one side with a bit of a waffle to it, and knit on the other. It's a unique grey-khaki color. 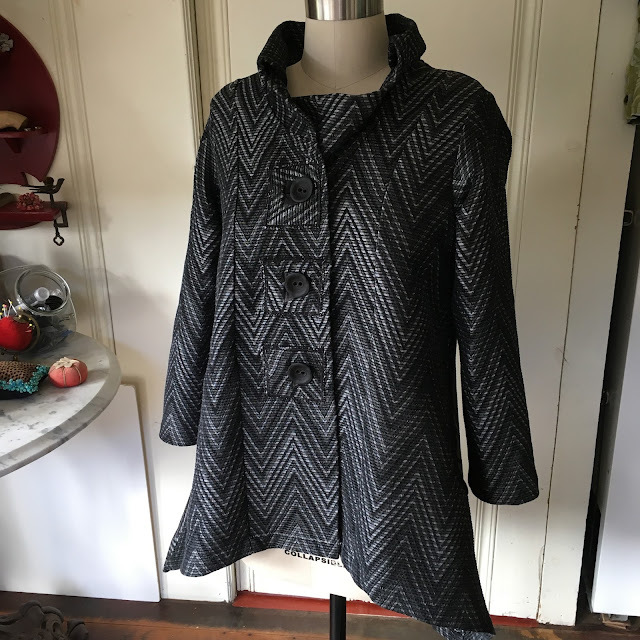 I used Diane's Ventana Jacket pattern. One thing I like about Diane's patterns is that you can adapt them in so many ways. 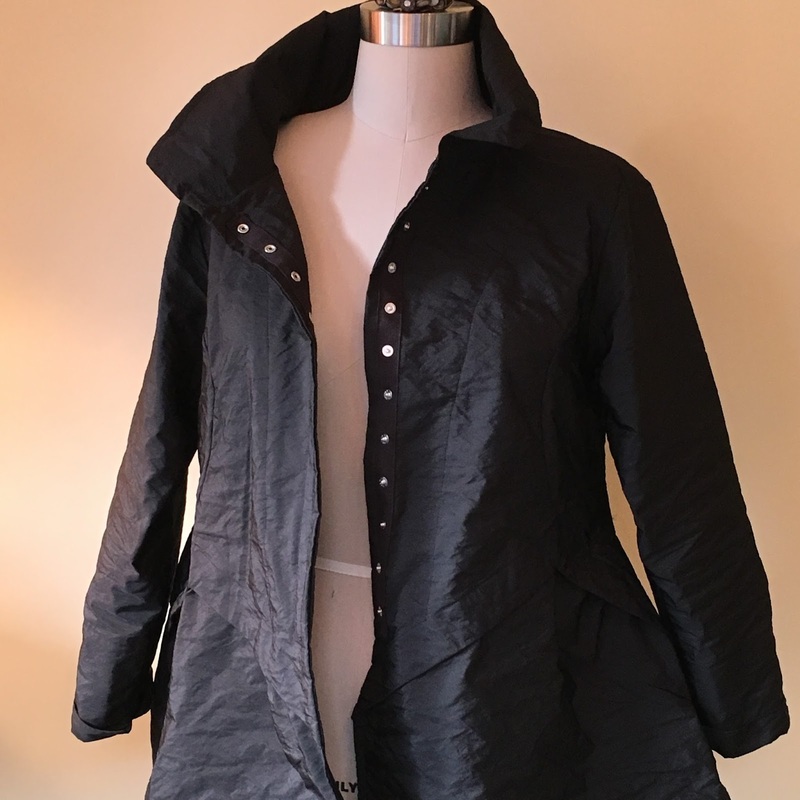 I didn't do too much to this one, just fiddled with the pleats and darts a bit and added a pocket to the other side. I gotta have two pockets...what do you do with your other hand? The darts make it so you can fit the pattern easily. I wanted it a bit snug in the back and full in the front. My second jacket was made using a very heavy upholstery type fabric from Marcy Tilton. 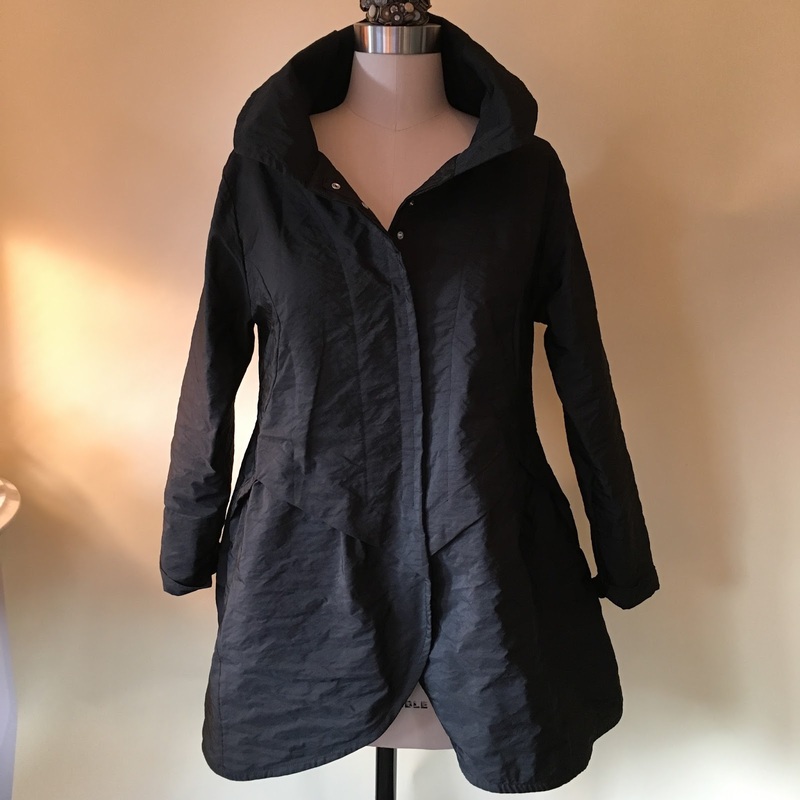 The pattern is B5891 by Katherine Tilton. I've used this pattern several times. Here, I've lengthened it. I used three triangular bound buttonholes I made as samples with scraps of the fabric. I liked the look of them sewn onto the garment so I went with that idea. They're a bit wonky but I like the look. 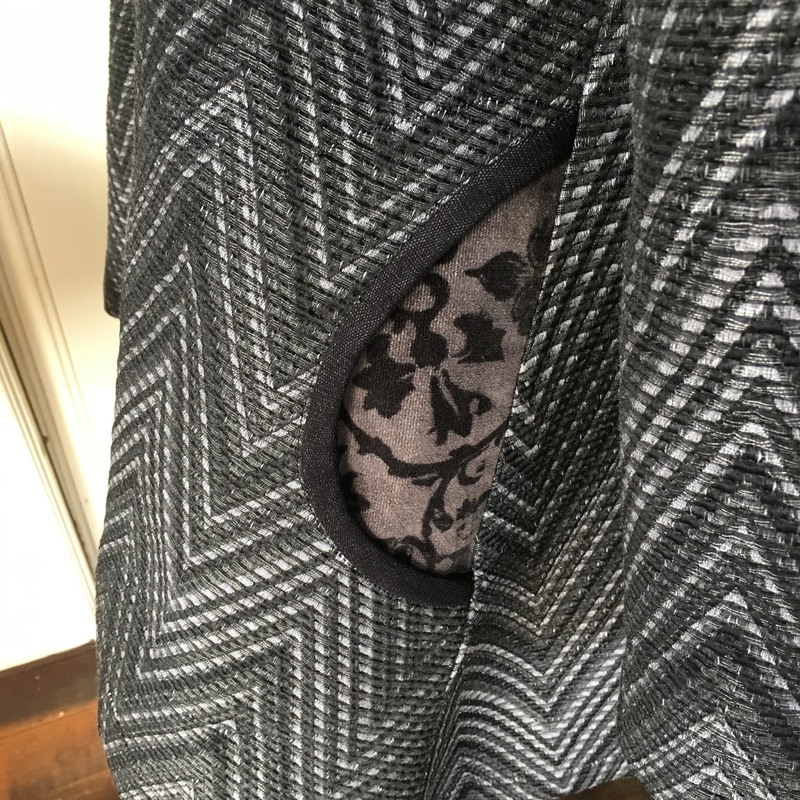 The pattern called for in-seam pockets but I prefer inset pockets. Inseam pockets always feel like they're set back too far for my comfort. First, I mark the position of where I want the pocket to be on the fronts. 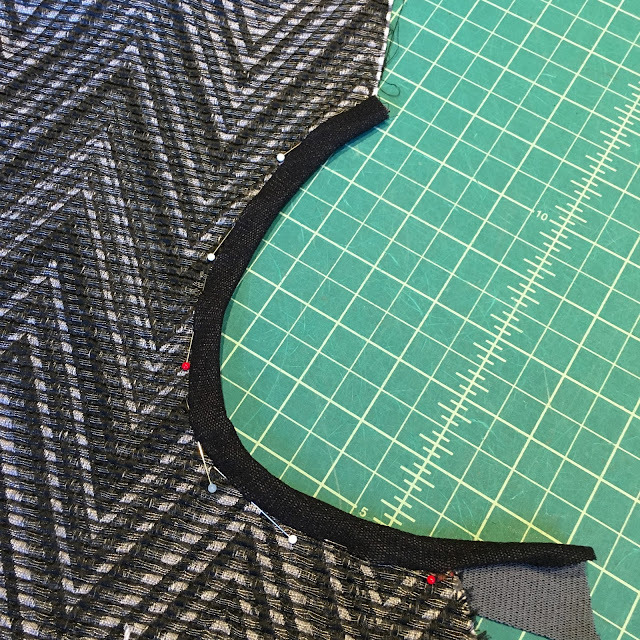 Using a rounded template I cut out the sides so that there is seam allowance both top and bottom. 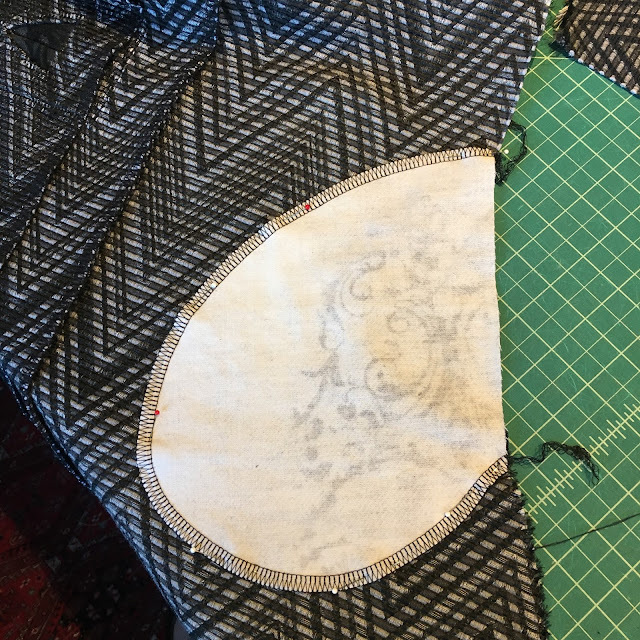 The pocket itself should be larger than the opening by about 1/2-5/8" top and bottom. I like to use a knit for the binding so that there is no need to cut bias strips, but if using a woven you will need about 10-12" of 2" bias cut fabric. Pin the bias strips to the fronts, right sides facing. I sew it on using a 1/2" seam allowance then turn the strip to the back, over the seam allowance (don't trim!) and top stitch it. Cut away any excess on the back and edges. I audition pocket shapes (I have several I keep in a file) to see which size and shape looks best. Above I position it under the side front to see how it looks. 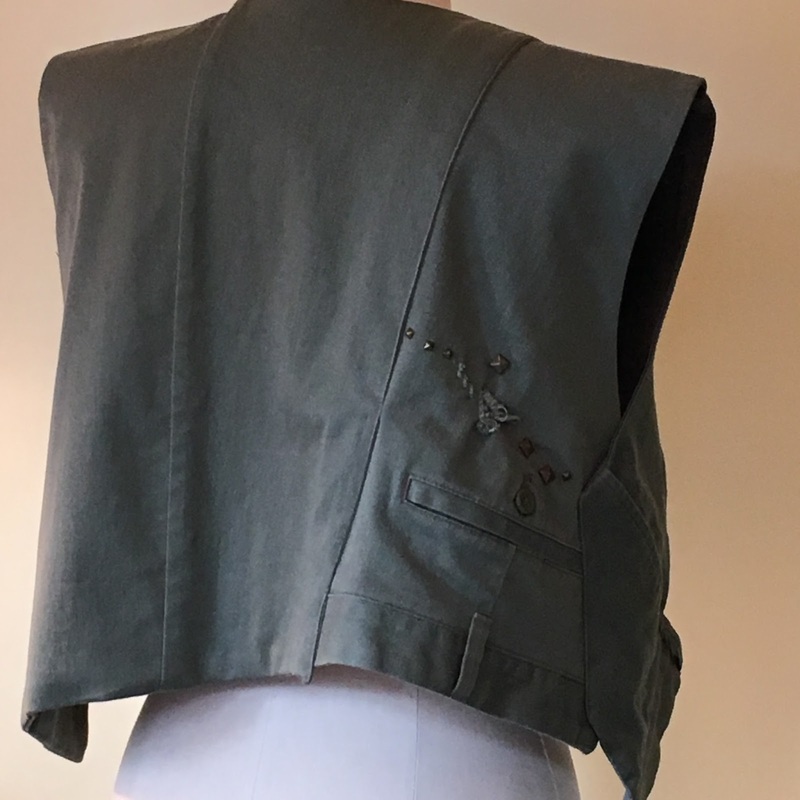 For this pocket back I used a gray velveteen that was stenciled by my friend, Sharon. I used it for the buttonholes, too. 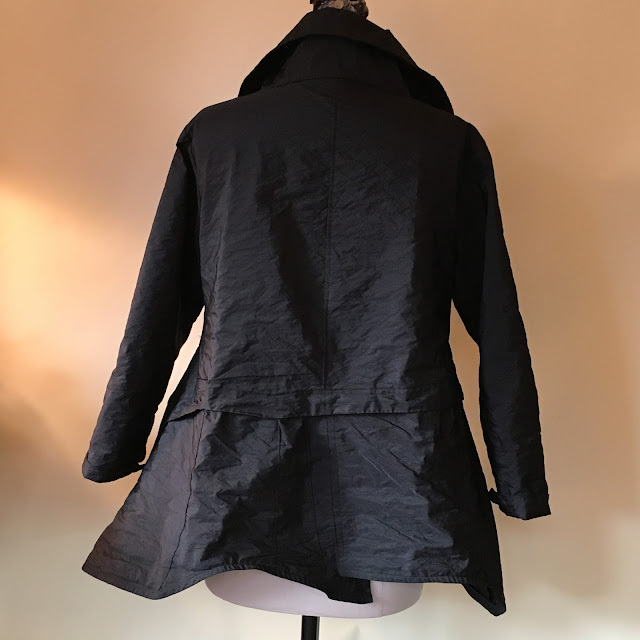 Before sewing it onto the garment I serge the edges of the pockets. 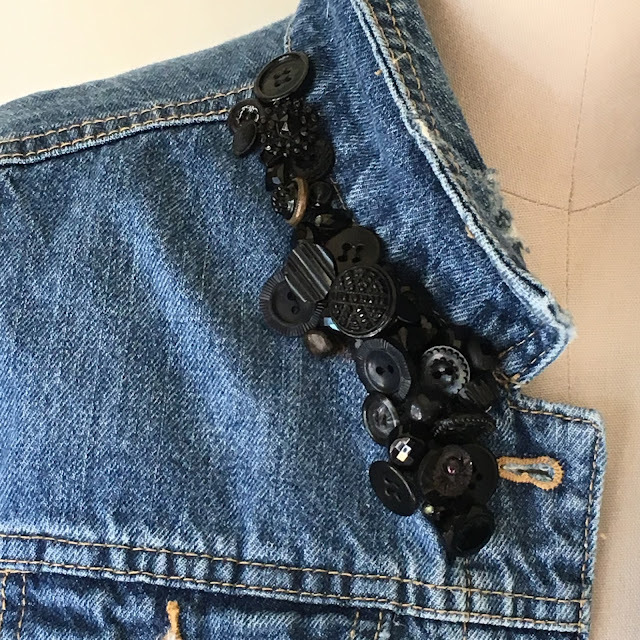 Sew it onto the garment right side of pocket to wrong side of garment. 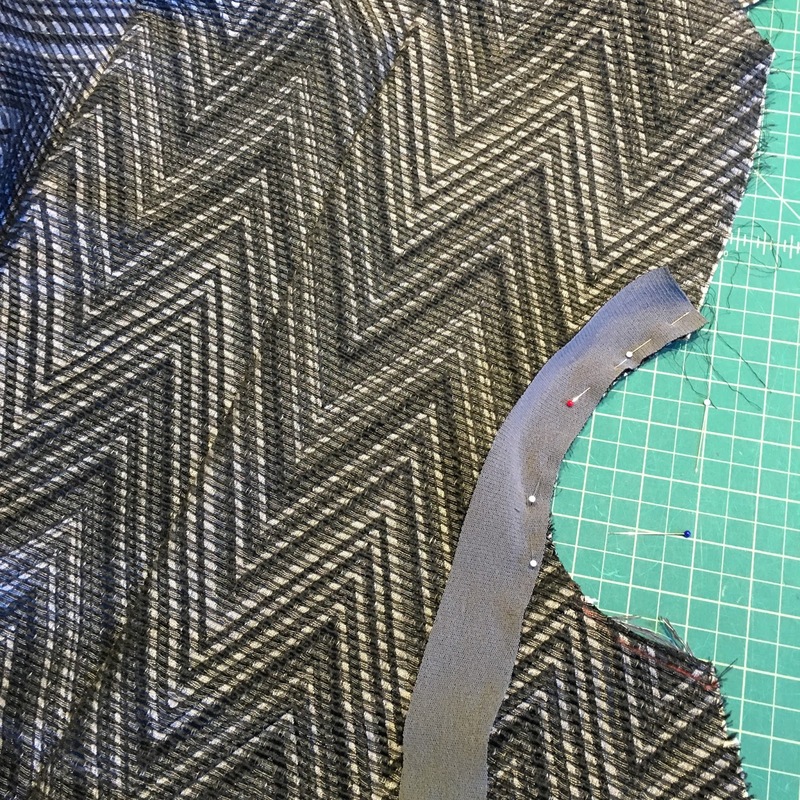 Finally, I sew the side seam, being sure to catch the side edge of the pocket. 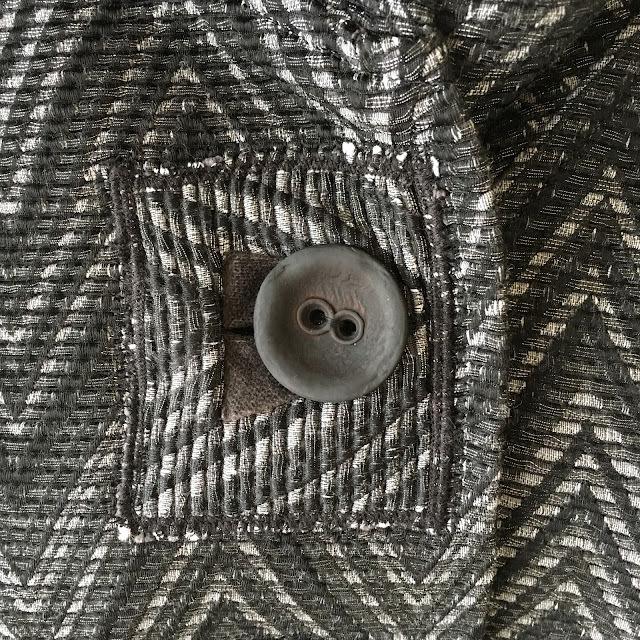 Close up of a wonky buttonhole. Marla, I promise to get better at this!! And here's my new baby. 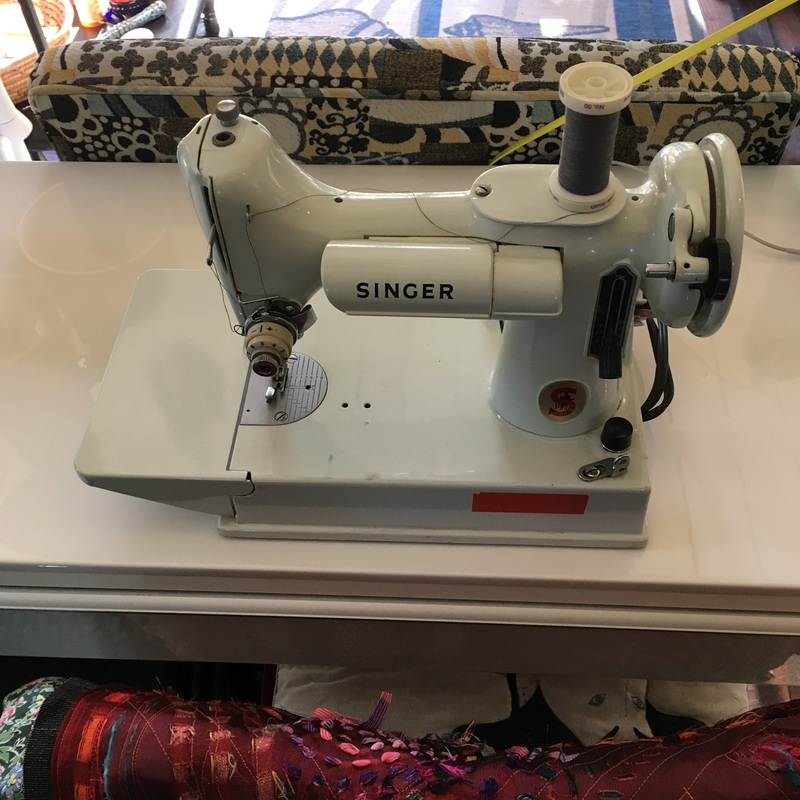 A sweet little Singer Featherweight. I bought it at a garage sale for $50! Another $125 to tune her up and she's a gem.